Muang Samui Villas and Suites are located at one of the most beautiful beaches on Samui. Choeng Mon is a small boutique village superbly located only 5 minutes from Samui airport and 10 minutes from the tourist hub Chaweng. Just a few steps off the beach you'll find the unique concept spa, Montara Beach Spa. Formed around the edge of the beautiful free form pool, the Montara design is themed around caves and enclaves. From the entrance the spa leads off down beautifully lit cave trails to various secluded treatment rooms. Each room is like a small cave with natural skylight hollows, where water gently trickles down in to an outdoor Jacuzzi/Bath. There are full WC facilities and each room has 2 large treatment tables for couples and friends to enjoy the experience together. There are 5 air-conditioned treatment rooms and 3 open-air treatment Salas. The treatments are focused on Aromatherapy through natural ingredients, such as herbs, fruits and honeys. Modern Western methods are fused with ancient Eastern traditions to ensure you experience total relaxation and rejuvenation. The Montara therapists are specialists in the signature treatments on offer. Packages include; herbal steams, aromatic baths, various body scrubs and wraps. Traditional Thai massage, Oriental foot massage, various types of aroma massages and cleansing facial treatments. 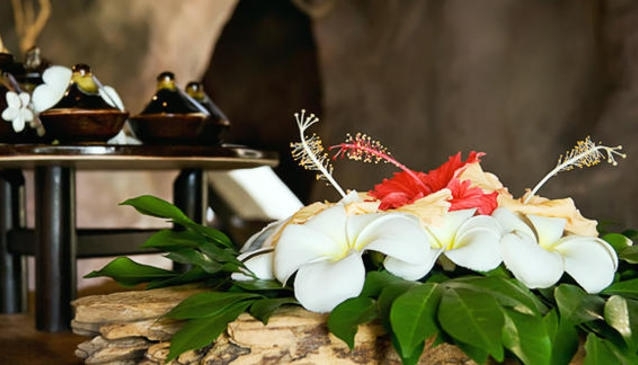 Once you enter the spa the feeling of relaxation begins to take over as you move from beach and sunshine to the calm and serene cove entrance where you are greeted by authentic Thai hospitality. A welcoming drink and cool face towel from attentive and courteous staff sets the scene. Before your experience begins you can decided on what type of of herb, ingredients or aroma you would like for your treatments or massage, the staff can explain the benefits of each as you test the samples at reception. We decided on the 'Romance' package for 2, a 4 hour mix of all types of treatments on offer at Montara, and we throughly enjoyed it. Time just seemed to drift on by unnoticed as we moved from bath, to steam, to body scrub, body wrap, oil massage and finally a rejuvenating facial treatment. Throughout the experience, all you hear is the gentle sound of running water, with complimentary music as the therapists work their magic. If you are enjoying a day on Choeng Mon beach and feel like a little pampering, just look for the centrally located beachfront caves, you'll be glad you did.